The $12.4 million fundraising haul brought in by Sen. Heidi Heitkamp (D., N.D.) in the aftermath of her vote against Supreme Court justice Brett Kavanaugh was due to a flood of out-of-state contributions. 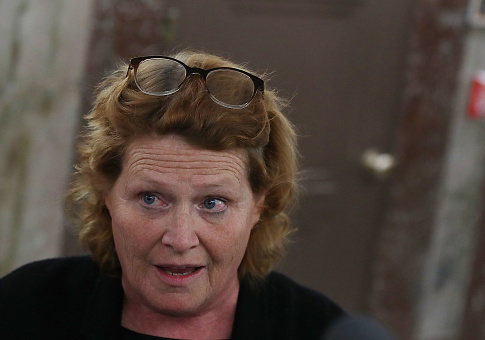 Only 2 percent of Heitkamp's "eye-popping" haul, which has been credited to her decision to stick with her party and vote against Kavanaugh, came from within North Dakota, according to an analysis of her latest filing with the Federal Election Commission, which covers campaign activity from Oct. 1 through Oct. 17. The campaign is only required to disclose sources of contributions over $200, which came to just under $4.9 million of the money raised. Only $105,568.17, or 2.15 percent, of the itemized contributions came from sources within North Dakota, where the incumbent Democrat is currently trailing by double-digits in the polls to Republican Kevin Cramer. A far larger proportion of donations came from deep blue coastal states such as California, which was the source of $1.25 million, or 25.5 percent, of itemized contributions to Heitkamp. She received $732,625.54—or 15 percent—from donors in New York. It is impossible to determine from the FEC report the geographic source of the unitemized contributions to Heitkamp, which are under $200 and accounted for $7.5 million of the fundraising. Heitkamp's campaign did not respond to a request for information on the unitemized contributions. Over the course of her current campaign, Heitkamp has received just 9 percent of her political contributions from within North Dakota, according to data collected by the Center for Responsive Politics. The campaign's statement on its fundraising figures, given to the Daily Beast, proclaims that Heitkamp will "only answer to North Dakotans." President Donald Trump defeated his Democratic opponent Hillary Clinton, who was endorsed early on by Heitkamp, by 36 percentage points. This entry was posted in Politics and tagged 2018 Election, Democratic Donors, Heidi Heitkamp, North Dakota. Bookmark the permalink.